The 2017 Practical Nursing summer graduating class was presented with nursing pins in a ceremony held at Central Tech in Drumright on Thursday, July 6, 2017. Nine students received class pins during the pinning presentation. The class includes Shelbey Lyon of Chandler, James Meyerring of Oilton, Raegan Earp of Cushing, Whitney Cooper of Sapulpa, Chelsea Baugus of Cushing, Danielle Smith of Stroud, Rebecca Gordon of Yale, Jessica Roe of Cushing, and Regina Howell of Depew. The Central Tech Practical Nursing (PN) program is open to adults and offered on both the Drumright and Sapulpa campuses. Students learn how to administer medications and treatments as prescribed under the supervision of a registered nurse, licensed physician, or dentist. Curriculum is comprised of 1463 clock hours with 656 of those hours spent in clinical settings. The PN program is accredited by the Oklahoma Board of Nursing. For more than five years, students graduating from the Central Tech PN program have achieved at least a 98.5 percent pass rate on their NCLEX-PN (National Council Licensure Examination) exams. According to reports, the state average is 91 percent and the national average is 82 percent. “Our NCLEX scores reflect both the nursing department’s dedication to helping make students successful and the student’s determination to succeed,” said Curtis Baker, R.N., Ph.D., practical nursing coordinator. 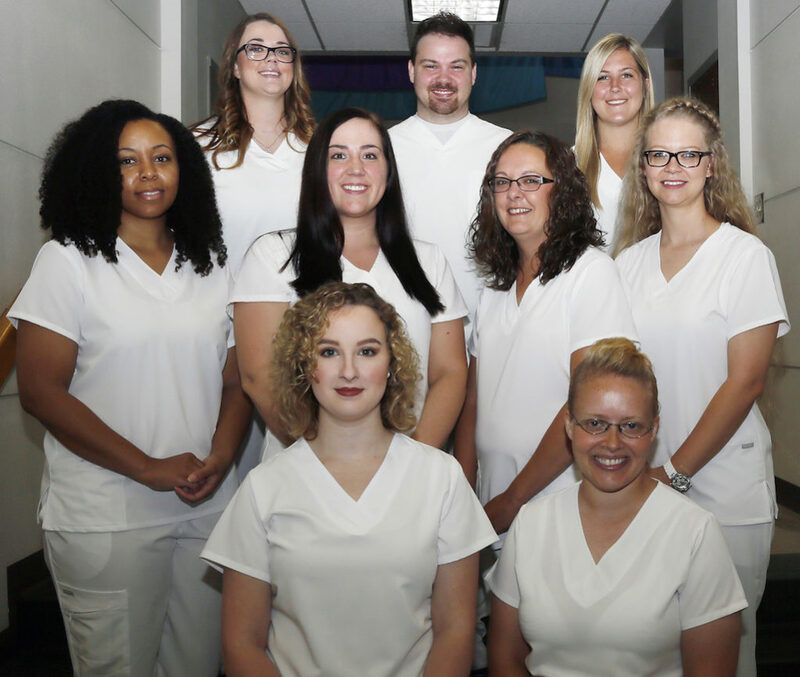 Nine students graduate from Central Tech’s Practical Nursing program Thursday, July 6. Back row: Shelbey Lyon of Chandler, James Meyerring of Oilton, Raegan Earp of Cushing, middle: Whitney Cooper of Sapulpa, Chelsea Baugus of Cushing, Danielle Smith of Stroud, Rebecca Gordon of Yale, front: Jessica Roe of Cushing, and Regina Howell of Depew.